To me, the unquestionable definitive take on Mr. Freeze is the Batman: The Animated Series episode “Heart of Ice.” It looks at a character who has often been a series of puns and takes seriously the psychological and physical toll that has made him who he is, a villain by circumstance if not by choice. Freeze is always more compelling as a tragic anti-hero than an outright villain, a man trying desperately to bring back his wife and set right his life. If every Batman villain is a dark mirror for the hero, Mr. Freeze represents Batman in two key respects: He is, quite literally, frozen at the worst moment of his life, unable to move on past a defining tragedy, and he is made cold, even unfeeling by his circumstances. Bruce Wayne never really moved past that night in Crime Alley when he lost his parents, and becoming Batman has turned him into a calculating, detached figure. 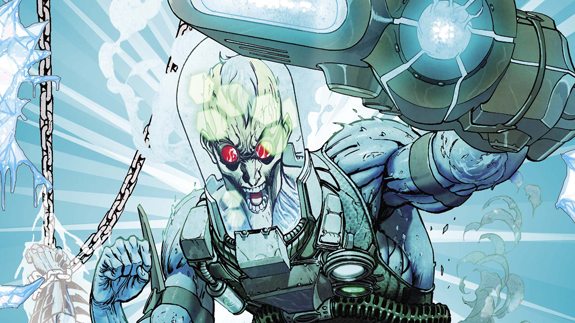 In The New 52, Freeze’s origin has shifted, and while it makes for a chilling tale, I think it is ultimately less effective. Scott Snyder used last year’s Batman Annual #1 to recreate Freeze as a mad man who was never actually married to Nora, but who was delusional enough to create a family to replace the parents he had lost. By shifting Freeze’s central trauma to parental abandonment, he is more closely tied to Batman and Bruce Wayne in a way that might be just a bit too on the nose for my liking, but if Mr. Freeze #1 is any indication, the move also robs him of his cold, deliberate anti-hero status. The issue posits Freeze as a more garden variety lunatic than he is usually seen to be, driven solely by the desire to preserve his family wherever he may find one. The script, by All Star Western scribes Justin Gray and Jimmy Palmiotti, only goes to the dreaded pun well sparingly, but it also fleshes out what is basically an anecdote to issue length. Jason Masters’ art is appropriately brittle and snowy, with a blue and white color palette by Dave McCaig that fits the character well. The story feels tossed off and inconsequential, but fans of the new version of Mr. Freeze will find enough here to satisfy them. Though the issue’s spooky ending is becoming sort of a Villain’s Month trope at this point, this is a serviceable story from a great Batman villain. It won’t set the world on fire, nor melt a heart of ice, but it’ll pass the time well enough. James Tynion has been working with Scott Snyder throughout The New 52, writing back-ups and co-writing larger events. Though he did not technically create The Court of Owls (credit for that goes to Snyder and artist Greg Capullo), he has been there since the start, and has written for them before. Court of Owls #1 is little more than a series of extended vignettes about the villainous society, and it feels like several of Tynion’s back-ups stitched together to issue-length. Its not bad, per se. Tynion is a smart bat writer and understands the court well, but there’s no actual narrative here, and much like last week’s Poison Ivy, “Exquisite Dread” doesn’t end so much as stop, waiting for another book or Villain’s Month issue to pick up where it left off. The issue doesn’t instill any of the titular anxiety, and it doesn’t even truly exploit the Court of Owls for all they are worth. The Owls know Gotham’s dark secrets and hidden alleys far better than Batman, but killing from the shadows is a trick we’ve seen before, and watching it repeated throughout the issue with little variation besides time period is more than a little tiresome. Harley Quinn is one of the best additions to Batman’s Rogues gallery in the last few decades, a psychologist turned psycho by exposure to the Joker. “Harley Lives” aims to give us an insight into the mind of the Joker’s right-hand woman, but what it reveals is just too…plain. Matt Kindt’s narration is far too linear, far too ludic to truly encapsulate the inspired lunacy of Quinn, and we’re left with just another Villain’s Month issue that feels like it’s squandered its potential. Artist Neil Googe has fun drawing Harley in all her various emotional states, and there’s a cartoonish whimsy to the visuals that is entirely lacking in Kindt’s flaccid script. “Harley Lives” doesn’t reveal anything new about the character, doesn’t present her voice in a strong way, and doesn’t even tell a particularly fun Harley Quinn story. This is the biggest worry I had going into Villain’s Month, and one that has often been proved all too true: this month long theme gives a huge opportunity for creative thinking and outside the box narratives, but it is mostly a series of lazy, tossed off stories that probably wouldn’t be strong enough to get published if DC wasn’t rushing to fill out its schedule. Often the key to successful stories so far in Villain’s Month is simple: An understanding of the character being featured, and a smart, fun, or interesting story about them. This is a bar that is being failed regularly so far, but Riddler #1 floats over it with ease. This is a simple story about a complex caper, the perfect one-off to focus on the man who is the Moriarty to Batman’s Holmes. The plotting is quick and propulsive, with a great grasp on Edward Nygma as a character and several excellent beats for him. This is an example of Villain’s Month done right. Ray Fawkes is a consistently solid writer who has been bumped around The New 52 quite a lot, but in “Solitaire” he shows he has skills DC just hasn’t figured out how to use yet. This is the sort of Riddler story that is smart but not self-consciously so, and compelling as both a character drama and as a caper. Riddle me this: why can’t every issue of Villain’s Month be this much fun?